Months ago I wrote about Gyrene Burger in Naples. It’s a new burger delivery concept by the founder of Domino’s Pizza with a military theme. Originally only burgers were served but they’ve added some sides and cola since then. There are 2 burgers you can order from but the differences are in the toppings. Both are double patties with American Cheese and Bacon on a sesame seed bun. The Classic also includes Ketchup, Mustard, Pickle but the Deluxe has got Mayo, Lettuce and Tomato. I picked up the Classic with only Cheese and no condiments. The Classic came wrapped in the now standard foil a bunch of burger joints are using and in a brown paper bag stamped with the Gyrene logo. I opened it up to find that squishy soft bun that gets me excited with 2 patties and 3 slices of American cheese (1 slice too many). The cheese was nicely melted. I’m gonna assume from the steaming process of being wrapped but however, it happened it was right on. The patties while thin were properly seasoned and better than more than half of the burger places out there selling “Gourmet Burgers”. 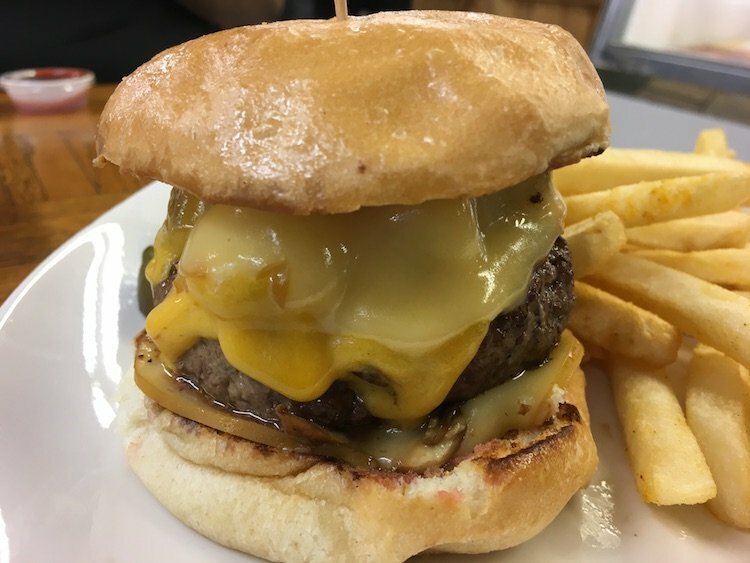 It also easily bests any fast food burger and the fact that you can get it delivered to your home should make it a done deal for those who live in the area.